Welcome to Industrial Warewashers, the UK’s largest commercial dishwasher emporium. 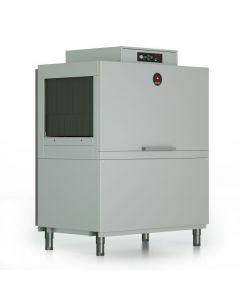 Our range of rack conveyor commercial dishwashers provides high performance dishwashers for large catering establishments such as hotels, high volume canteens, food production and public-sector areas. Often used to clean dishes, glasses and cutlery on a high volume scale. Baskets of dirty items are placed onto a conveyor system that then automatically pulls the washables through the washing system and deposits clean baskets onto exit tabling on the other side. We work with some of the UK’s leading hotel chains and public-sector establishments to design, specify, install and maintain conveyor dishwashers from leading brands such as Sammic, Classeq and Mach. 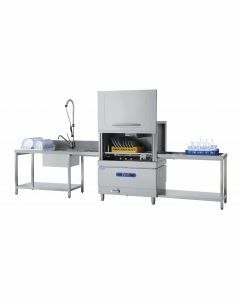 With such a wide range of rack conveyor dishwashers available, we can provide flexibility to match a high capacity commercial dishwasher to any volume and any specific requirements of your business or establishment. As a specialist conveyor dishwasher supplier, Industrial Warewashers can offer unrivalled after sales and service thanks to our in-house servicing and repair specialist team, exclusive warranty packages and full UK parts stock at discount prices. 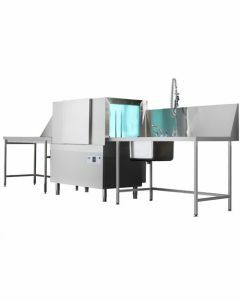 Conveyor dishwashers are generally specified to a customer’s requirements before installation, why not speak to our specialist conveyor dishwasher consultants for a free no-obligation quote on your next washroom installation and design.